I’ve been eating magoes like they’re going out of style these past few weeks. I get them in the Indian markets in Jackson Heights, Queens where they sell them by the box for like $7.99 for ten. Did you hear me…$7.99 for 10, for the big red and green, juicy ones! 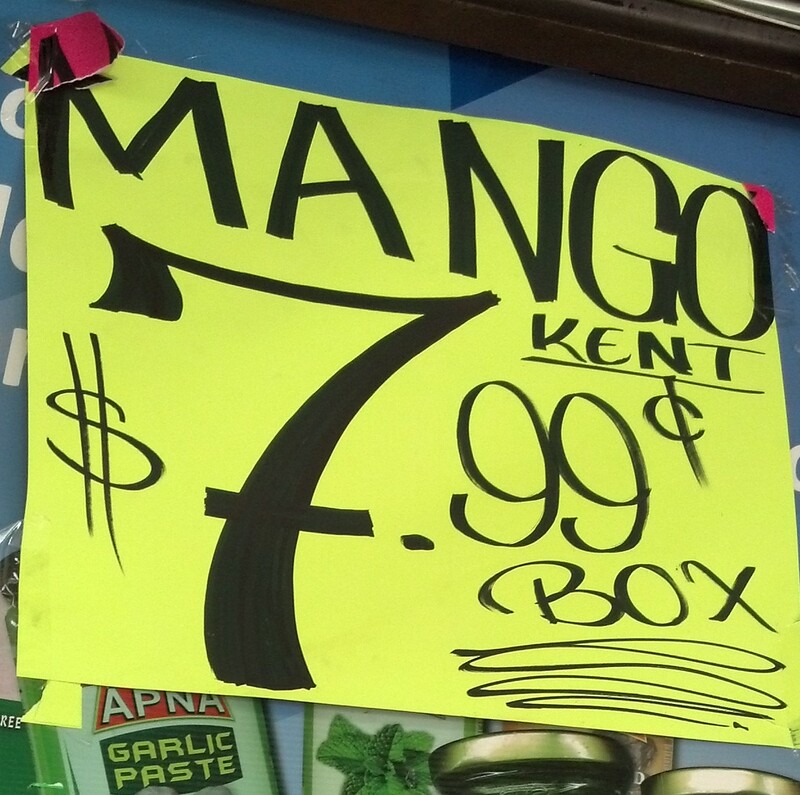 The great thing about Queens is that it is super-ethnic, meaning the food and ingredients you find here are the real deal, and super cheap to boot. 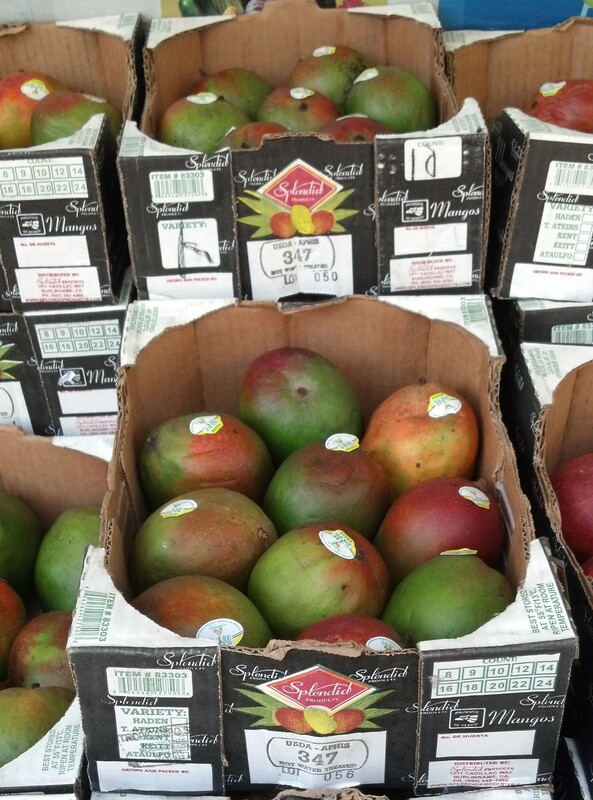 Nothing gives me greater pleasure than sharing an amazing food find and these mangoes are an absolute gem. They remind me of the mangoes we eat in Colombia when we visit my family in the little town of Girardot, where my mother grew up. It’s a tropical place [read: hot as blazes, although not unlike the weather we’ve been having lately in New York] but I have great memories of spending time there as a kid and eating the most delicious mangoes for breakfast. I sincerely wish I could give you all a virtual sample—they are that good. I enjoy them best just sliced, and then standing over the sink eating the pit with the juice running all down my arms…I’ont care. With all this mango-eating I’ve kind of taken a crash course in how to cut a mango, with not always successful results. I usually peel the outside first with a vegetable peeler, and then I use a knife to cut around the pit. I’ve found the riper the mango though, the harder it is to work with. It just becomes a slippery, mushy mess. So for answers, I went to the experts: the Spanish ladies who sell perfectly sliced mangoes in little plastic baggies from carts in Union Square. Turns out, the one lady I spoke to outside Whole Foods has an ingenious little trick: she stabs the top of the mango with a screw driver, then peels and slices it, thus avoiding the whole slippery, mushy mess you make by having to try and hold it with your hands. Brilliant! (Assuming it wasn’t recently used to unscrew a rusty nail of course). Now that I know how to properly cut a mango—with the help of hardware—I’ve been thinking of ways to use them in recipes. I’ve made mango smoothies with coconut milk and ice…even a little banana and some blueberries if I have it. I’m thinking of trying some kind of mango mousse or pudding. I had some version of that at Porto’s Bakery in Burbank when I used to live in California, and it’s a dessert I still dream about. By the way, if you ever visit the West Coast or if you live there and have never been, Porto’s is not to be missed. It’s a Cuban, family-owned business that sells top-notch pastries and cakes as well as Cuban sandwiches and other savory specialties like meat pies. Plus it’s super cheap! 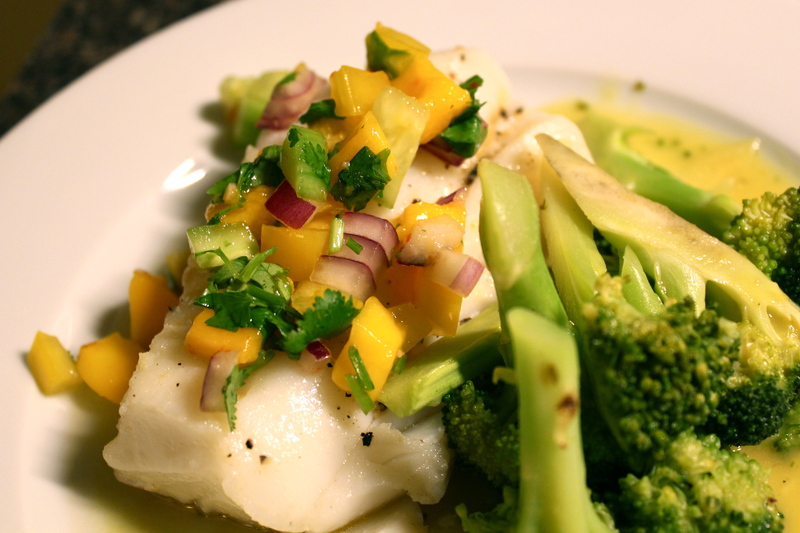 So the other night I was feeling like something light and summery for dinner, so I stopped by the Asian grocery and bought some cod fish fillets. I seared them on both sides with a little butter, olive oil, salt, and pepper. 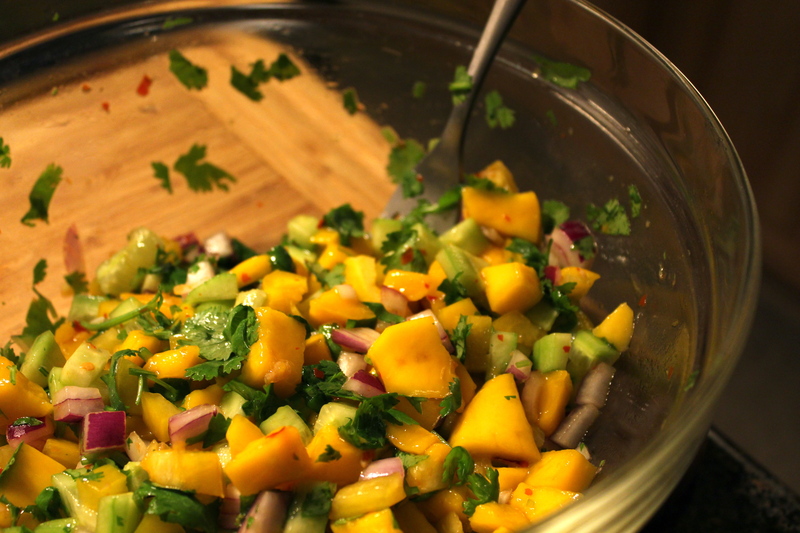 Then I made some mango salsa to go on top (recipe below). Broccoli on the side and BAM, I had dinner! Combine all ingredients and mix. You can eat as is or refrigerate overnight—I don’t have the forethought to make something like this the night before, but I had some leftover and the flavors seem to meld a little better the next day. A dash of sea salt before serving doesn’t hurt either. (Please note: I wrote this after the fact so don’t plan your wedding buffet off it. Makes enough for like 4-6-ish people). Also, if you want to make cutting mangos less intense, I bought one of these (http://www.oxo.com/p-465-mango-splitter.aspx) and absolutely love it! 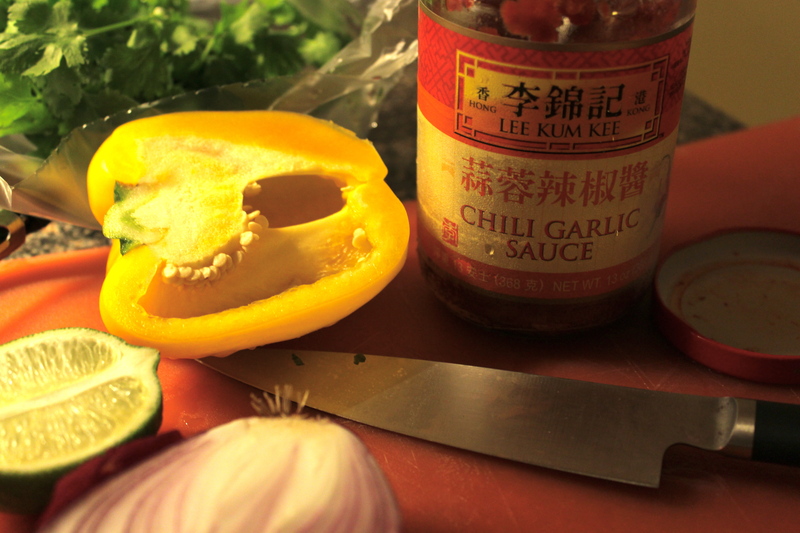 LOVE mango and sticky rice—I need to try that! And thanks for the tip on the mango slicer. I am a sucker for kitchen gadgets. I actually have a similar one I use for apples. Great idea!